Comprising everything needed to begin taking instant film photos, the passion red FUJIFILM INSTAX Mini 70 Instant Film Camera with Monochrome Film Kit from B&H pairs the versatile instant camera with a single 10-sheet pack of INSTAX Mini Monochrome instant film. 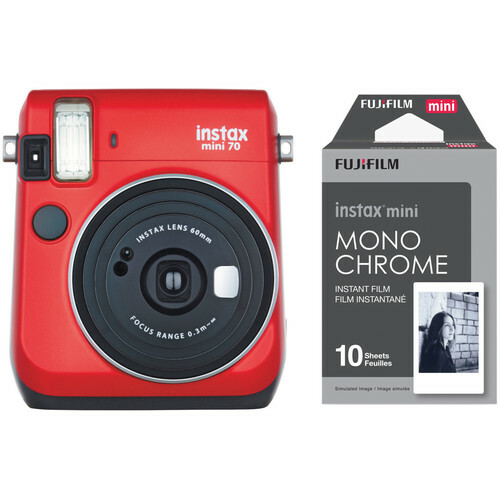 Box Dimensions (LxWxH) 3.9 x 2.6 x 0.85"
INSTAX Mini 70 Instant Film Camera (Red) is rated 4.5 out of 5 by 29. Rated 5 out of 5 by John from Make friends quickly I bought this Instax camera to have with me on a trip to Cuba. Some of my travel companions spoke Spanish, but I did not. So I used the Instax to break the ice and help connect with the wonderful people I was meeting on the trip. The Mini 70 worked great for this. Exposures were all right on and I didn't have to fiddle with any controls. The size was good for me. And I love the yellow color to help be noticed. Both kids and adults loved the instant photos I gave them and I think I got better photos with my regular cameras because of the rapport built with the instant photos. Rated 5 out of 5 by Anonymous from Awesome! Does exactly what it says! Takes photos at an appropriate quality, love it, love it, love it! Rated 5 out of 5 by Raymond from Cute fun Camera Great camera, easy to use and fun to bring to parties. Pictures produce right away and puts smiles on peoples faces. Best photos are close-ups. Not distance. 2-3 people at a time. I see some reviews on this and other INSTAX cameras complaining about the photo quality. This is not a digital camera or a film camera. This is old school instant photos. The photo quality was never that great on them. Dont expect Digital quality. Expect old school Polaroid 1970s photo quality. That is the Charm of this camera. Kinda Retro. Enjoy it for what it is and not what it isnt. Rated 1 out of 5 by Kirk from Fun idea, poor output I’m a semi-pro photographer. You can get about a 25% success rate out of this unless you are using it with controlled studio lights. Selfies don’t work (flash blows everything out), and you have to hit correct brightness outside at the correct distance to have a prayer. Loved the idea, but I think one of those mobile printing gadgets will be better... at least you can get a good photo out of your phone and then print it on the spot. Wished this worked; I have great memories of my Polaroid growing up, which worked a lot better. Rated 5 out of 5 by Anonymous from Great shot Love love love this little camera!!!! Great present or a nice keeper for yourself!! Rated 5 out of 5 by Anonymous from Best polaroid camera Love the options of being able to take selfies. Rated 5 out of 5 by Kyle from You Are Going to Have So Much FUN with this Camera Besides taking great images, the instant gratification of getting images on the spot make this a must have for anyone looking to have fun. Camera is straightforward and easy for anyone, even beginners to use. Take this to a party, family function, picnic, wedding, etc, and youll have so many people thanking you. Make sure to get like three times the amount of film you think youll need - because youll be sure to run out once the fun begins. Rated 5 out of 5 by Anonymous from The Best Camera Store!! Literally will buy all my camera equipment through here. Online of course since I live thousands of miles away :( I was beyond satisfied with this purchase!